Q. You spoke about the conditions on the court. What was affecting you out there? RAFAEL NADAL: No, the conditions are very changing during the day, and during the night here is big difference. For me it was the first day I was able to play a match during the day, so the ball was much weaker. With a normal ball during day and night there is differences, but with that ball is completely dramatic how the things change, no? That ball don't have feelings. During the day especially the ball is very, like you are touching a stone. There is no feeling for the ball. I see a lot of player having a lot of mistakes from a lot, you know, mistakes not just for a while, just for one meter or two meters, and that's not good for our sport. But that's what we have today. We have that ball. I think ATP and fans deserve a better ball to have a better show. But I am playing well. I'm practicing very well every day. Playing good match the other night. Today I play with a little bit more mistakes, but having the feeling that I am able to do it well. I feel confident that I am playing much better than one month and a half ago. I feel closer to be what I am, what I want to be, and it's a positive victory for me, another victory. Every victory is important victory for me. Already six matches in a row winning, and that's a good number. I am confident, and I hope that tomorrow I can play a good match. Q. Considering the fact that you lost last year in this round, does it give you a sense of relief making it through this year? RAFAEL NADAL: Last year is 2014; we are in 2015. We cannot think about what happened last year in every round and in every tournament. Every year is different. For me that tournament is a tournament that in the past was very positive for me. I played a lot of good tournaments here, good results, a lot of times in advancing rounds. I like playing here. I love the players. I love the organization. I love the fans here. I feel very comfortable, no? I happy to be in the fourth round. Fourth? Yeah. Third for me, fourth for the tournament. That's positive news for me, winning two matches. Tomorrow I have a tough match against Simon. He's tough a good player. He started playing the season well. He's a player that gives you a little bit more rhythm than Donald Young. Donald Young played very aggressive today with strange mistakes, winners, so was not easy to manage how to play really the match. I was able to find solutions. It's true that I had few mistakes with my serve. But then with positive attitude in the next game, I was able to have breaks, too. Q. Do you prefer the drier conditions here? Can you give a comparison with Melbourne and here related to fatigue, cramping? RAFAEL NADAL: Obviously the dry conditions, even if it's warm, are better for playing tennis and for the health of the players are better. Extreme conditions are obviously not ideal to practice high intensity of sport or professional sport. Rio was very hard this year. Last year was positive. Was hard, but not that hard. This year was amazing, the humidity. Here always is a little bit warmer here than a few years ago. I think this year during the night normally is colder here, and this year I feel that is not cold. But the conditions here to play tennis, for me, is difficult to find a place with better conditions. Q. Gilles hasn't won against you, Djokovic, or Federer since 2008. Do you think he's more dangerous than five or six years ago? RAFAEL NADAL: He won against Andy Murray, no, few times ago? He had good start of the year, I think. He had good result in indoor, too. In where? Marseilles. He won? RAFAEL NADAL: He won the tournament? Yeah. Was tough final against Monfils, no? I don't really remember who won. But he is playing well. He had a good beginning of the season. Is true he had some problem in his neck last couple of years, no? He had some injuries there. So he's playing with injuries, with pain, with no continuity is very difficult for everybody. He's healthy now. He's playing well. He's a very dangerous player. Q. Issues with the balls on the tour are not new. Is there anything players can do about it, or just accept and deal with it? RAFAEL NADAL: I think the players said what they have to say. Is not new. Something that happens since a while. I didn't understand very well, because the brand that is making that ball they say now is a new ball, but still bad and I don't understand why. Because if it's a new brand creating new ball, you can understand that they make not a bad ball. But the same brand five years ago had a great ball, very good ball. Is difficult to understand why today they are not able to do it. Q. A few nights ago you came off the practice court and you were talking with some people in the field. There were hundreds of people in the dark waiting for you to come and screaming your name. I was wondering, at what point in your life, in your career, did you realize, This is normal for me? I'm standing here having a conversation and everybody is screaming, Rafa, Rafa? And also, when you go over to sign, is it difficult to make a decision, knowing that it will take a long time or that no matter how many things you sign there will still be people who don't get signatures? Talk to me about that a little. RAFAEL NADAL: You know, when I can, before the days that I am not playing, I trying to sign as much as I can. I remember the previous day before, before I start the singles, I practiced 6:00 to 8:15. I stayed for 20 minutes signing as many people as possible for me no? Is true that is not possible to make everybody happy, but what is in my hands is try to make as many possible people and ‑ especially the kids ‑ happy, no? Because I understand an autograph or photograph is much more important for a kid than for other persons, no? So I try to do my best. Never will be normal for me when the people are screaming my name. I know is a situation that happened for a while since I started to be a good player, probably, since 2004, but especially after 2005. I know that's for a couple of years. I know that's not gonna happen in ten years. So just accept that in a special situation, trying to enjoy as much as I can of that situation, try to say thanks everybody for the love and for the support that they give me. Is a special thing, I think. Is a thing that not a lot of people have the chance to enjoy or live that situation, and I always appreciate so much the support and the love of the people, all the positive energy that the people brings me. Helps me a lot on the low moments, on the bad moments. That's it. I try to be normal, try to understand that's gonna change in a couple of years and try to be very, very normal during all my life. Q. As you know, everybody no doubt knows you are a Real Madrid fan. After four days there is a El Clasico between Real Madrid and Barcelona. What can you tell me about this game and your expectation for this soccer game? RAFAEL NADAL: Well, as always, is an important match and especially with the situation that both teams are right there with one‑point difference. Will be a very important three points for Real or Barcelona. Is true the dynamics are a little bit better from Barcelona, but is true that Real Madrid has a great team. I think they arrive to that match with a little bit less pressure, because the last couple of results haven't been perfect for my team. But let's see, you know. Barcelona is doing great. He has amazing players, great team, playing at home. Barcelona is favorite. But as a Real Madrid fan, I am always confident that my team will play a great match and have a chance for the three points and be in the first position again. Q. How is it today playing a left hander, playing another left hander particularly in these conditions, because Donald is lefty? 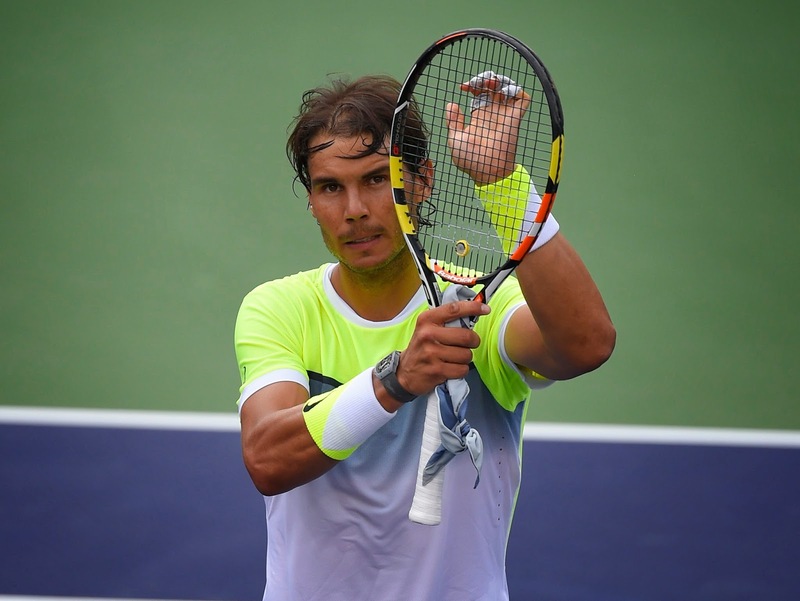 RAFAEL NADAL: Well, as I said before, it is a little bit strange because there is not two points equal. One point he played with mistake and another point he played a great winner. Then he was serving serve and volley and then he played slower, so was not a very logical match. But I did what I had to do to be through. Winning in straight sets, I'm happy with that situation. I need to serve a little bit better tomorrow as I did the first day. Let's try.